The Memory chart displays historical statistics on memory utilization for the selected infrastructure object. The following table provides information on predefined views and counters that apply to hosts. Sum of all active memory metrics for all powered-on VMs and vSphere services (such as COS, vpxa) on a host, as estimated by VMkernel based on recently touched memory pages. Amount of physical memory used on a host, including memory used by the Service Console, VMkernel, vSphere services and total memory consumed by running VMs. Potential memory demand that is based on total allocated memory for running VMs, memory overhead, effects of memory Transparent Page Sharing and total available memory. Memory usage as percentage of available machine memory. Amount of memory swapped to disk: sum of memory swapped for all powered on VMs and vSphere services on a host. Rate at which memory is swapped from disk into host active memory during the current interval. Rate at which memory is swapped from host active memory to disk during the current interval. Amount of memory allocated by the VM memory control driver (vmmemctl). Amount of RAM pages memory compressed by a host instead of swapping to disk. Total amount of memory overhead metrics for all powered-on VMs, plus memory overhead of running vSphere services on a host. 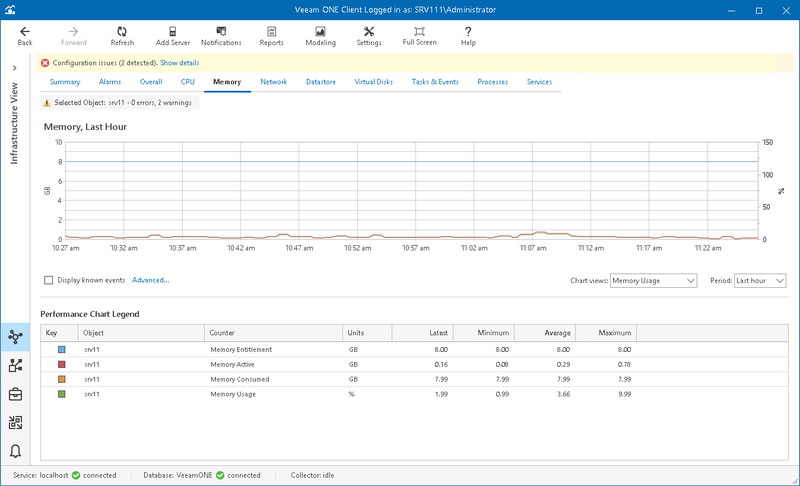 Sum of memory shared metrics for all powered-on VMs, and memory consumed by vSphere services on a host. Amount of memory shared by all powered-on VMs and vSphere services on a host. Percentage of time a VM is waiting to access swapped or compressed memory. The following table provides information on predefined views and counters that apply to VMs. Amount of guest physical memory actively used, as estimated by VMkernel based on recently touched memory pages. Amount of guest physical memory consumed by a VM. The value includes the shared and memory that might be reserved but not actually used; overhead memory is not taken into account. Amount of host physical memory a VM is entitled to, as determined by the ESX(i) scheduler. Memory usage as percentage of configured physical memory for a VM. Amount of guest physical memory swapped out to the VM swap file by the VMkernel. The metrics refers to VMkernel swapping, not to guest OS swapping. Rate at which memory is swapped from disk into active memory during the current interval. Rate at which memory is swapped from active memory to disk during the current interval. Amount of RAM pages compressed by a host instead of swapping to disk. Amount of machine memory used by VMkernel to run a VM. Amount of memory saved by memory zipping. Amount of guest physical memory that a VM shares with other virtual machines (through VMkernel Transparent Page Sharing and RAM deduplication). For objects that are parent to ESX(i) hosts and VMs, Veeam ONE Monitor displays rollup values. Charts for folders, clusters, datacenters, vCenter Servers display rollup values for all hosts in the container. Chart for a resource pool displays rollup values for all VMs in the resource pool.